I visited Italianni's again last Thursday night with my hb in tow. When we first walked in, a smiling hostess greeted us warmly. Then we were seated promptly, and she told us that Rodel would be our server that night. Immediately our drink order was taken and served. The facade of the restaurant is simple yet refined in its own right. The linen in blue/white add some fun and colors to every table. Italianni's is not a roomy restaurant but it has a narrow bar area along with bottles of wine and spacious outdoor seating at their covered patio. The restaurant has cozy, casual environment where the solid wood and subdued lighting are mixed with the warmest attention that evoke the best of Italian traditions. The place is surrounded with travel images and framed vintage photographs of family life. 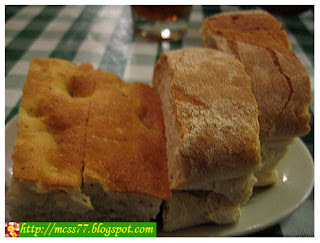 The best part is... they serve right at the start of the meal, a complimentary slice of homemade foccacia bread and slice of tuscan bread with balsamic vinegar & olive oil. 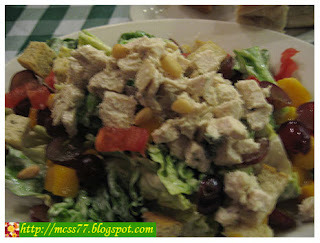 Then we ordered Chicken Sicilian Salad Lunch (P350.00), Italliani's specialty with fresh vegetable and a handful of toasted focaccia croutons, sliced chicken, mango and grapes. 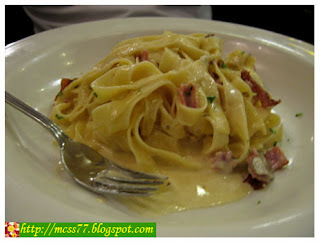 and Classic Carbonara (P380.00), fettuccine pasta with fresh button mushrooms and smoked bacon in a light parmesan cream sauce. We also had Iced Tea for drinks. I wanted to try their dessert and was actually eager for it, but I was already pretty full from the salad. In fact, I had to struggle up to the last bit of it. Total amount paid was P1,112.00 including vat. 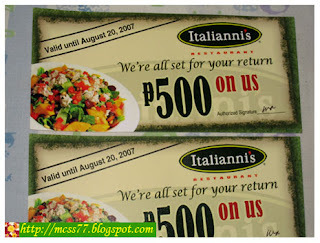 After we had our dinner, they gave us a P500.00 discount coupon which is valid until August 20, 2007 only. Overall, Italianni's has great service, warm, conventional vibe with decent food that won't disappoint every guest. Sicilian Salad Reg (P550.00) - My Fave. Love it! Seafood Cioppino (P520.00), fresh mussels, shrimp, baby clam, tender calamari with mushrooms sauteed in garlic, white wine and cioppino sauce. Served over linguine pasta. Iced tea (P95.00) - Love it! and Brewed coffee (P85.00) for drinks. Needless to say, my mom and the rest of us were all happily contented that night. Italianni's Restaurant is a definite place to check out.